Ahh, the white wedding dress. While it’s traditional, it’s definitely not a necessity. Brides these days are getting super creative with their wedding day wear, and are discovering an arrangement of new color choices. From bold hues to unconventional prints, we’re rounding up some of our favorite wedding dress colors. Move aside, white gown. These lovelies are just as wedding-day appropriate. Blush has been the #2 wedding dress color for quite some time. And there’s a reason why. Next to white and ivory, it’s the next-best neutral and it’s so utterly romantic. Even for non-pink-fans, this color makes a perfect next stop on the wedding dress color line if you’re looking for something out-of-the-ordinary. 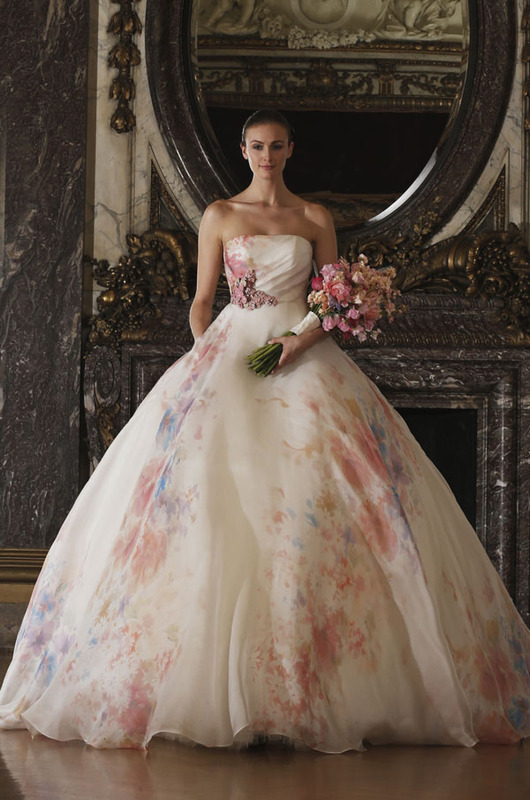 If you’re looking for a hint of color without going ALL the way in, a floral wedding dress is your best bet. Not only are they romantic, they are totally unique and a modern update on the wedding dress. This option from Romona Keveza is for the bride looking to a stunning and elegant statement moment at her wedding. Seeking something blue? What about making your wedding gown exactly that. 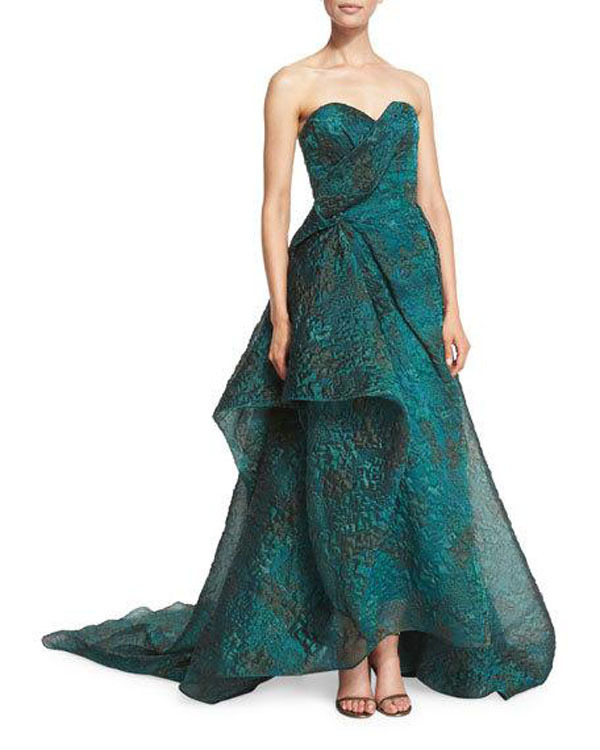 A show stopping, something blue wedding gown that’s sure to surprise the wedding guest crowd. And, it’s effortlessly dreamy without going too bold on the color palette. We admit, it’s definitely not the first thing you think of when it comes to wedding dress colors. But if you’re the bridal antithesis and a lighter color is not for you, black can be an elegant and fashion-forward option. This is your wedding, so we say wear whatever color you choose! Are you really looking to go outside of the bridal wedding dress box? How about a camouflage wedding dress? Albeit this option is definitely for the non-traditional bride, we think you’d look pretty awesome (when done right of course). This version from Rubin Singer hits the camo note without being overly literal. Looking for a true statement color? We love a red wedding gown! The color really lets the designs make an impact – as you can see the level of detail on the gown so well. Vera Wang’s known for putting colorful gowns on the runway occasionally, and this red version from their now iconic collection is like a work of art. If you’re after a softer color, mint green has recently become one of our favorite wedding dress colors. Maybe it’s because when coupled with the beauty of a Jenny Packham design, you are absolutely going to totally win the wedding gown game. Still want to go neutral but not about white or ivory? How about going a slide next on the color scale with a tan gown. Some of our favorite neutral gowns are from the boutique designer Samuelle Couture. You’d recognize her dresses anywhere once you know her name. When it comes to pastels, pink is not your only option. Lilac can make a beautiful wedding dress color. This Marchesa drop waist gown is so delicate but perfectly adorned with lilac beading and floral accents. And we love that it’s a non-wedding gown, wedding gown. When you think of weddings you probably think of silver metallic accessories. But what about gold? And what about a gold wedding gown? We’re saying yes! Especially to this version by Jenny Packham that is so 1920’s charming.